Today, a Twitter drama in four acts. Act one: In Act Two, we are introduced to Rep. Justin Amash, son of a Palestinian immigrant, thorn in many Republicans’ sides. In Act Three, McCain brushes aside the critics. And in Act Four, Amash says the cruelest thing that you can say to any white person. I’m no expert, but I believe the “racism” accusation is based on Ahmadinejad’s swarthiness. 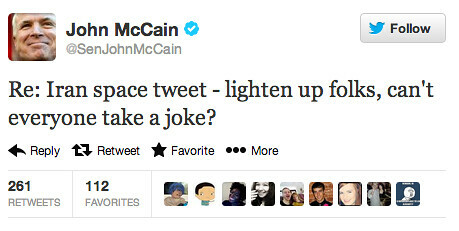 Did McCain ever end up backing down on his early 2000s usage of the word “gooks”? Did Gran Torino retroactively make that ironic?